"Nothing can compensate for our pain but it is important that justice is done." Ex-Bosnian Serb wartime general Ratko Mladic appears in court at the International Criminal Tribunal for the former Yugoslavia (ICTY) in the Hague. SREBRENICA, Bosnia, Nov 22 (Reuters) - Bosnian Muslims who lost loved ones in the 1995 Srebrenica massacre said on Wednesday that no punishment was enough for Ratko Mladic, the ex-Bosnian Serb wartime commander jailed for life for genocide. 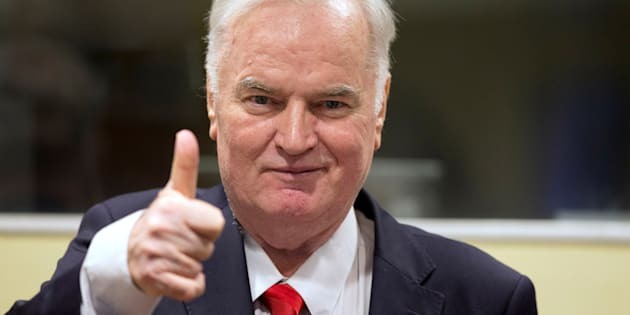 Mladic, dubbed the "Butcher of Bosnia," was convicted by a U.N. tribunal on 10 counts of war crimes including the siege of Sarajevo in which over 10,000 civilians died from shelling and sniper attacks, and the expulsion of hundred of thousands of non-Serbs during the 1992-95 conflict. "Can there ever be adequate punishment for someone who committed so many crimes? It would be too many even for 300 years, let alone three days," said Vasva Smajlovic, 74, referring to the Srebrenica slaughter in July 1995. Her husband, son-in-law and other relatives were among the 8,000 Muslim men and boys taken away and shot dead execution-style after Mladic assured U.N. peacekeepers and local residents that no harm would befall them after his forces seized the town. "I try to count my dead all the time. I count to 50 and then I'm not able to count anymore," Smajlovic said tearfully while watching a live telecast of the Mladic verdict. "No words can describe how I feel. I am angry. All this comes too late." Her sister-in-law felt, however, justice was served with Mladic's conviction, even if it came 22 years after the war. "Nothing can compensate for our pain but it is important that justice is done," said Bida Smajlovic, who last saw her husband when he tried to flee Srebrenica through woods in July 1995. His remains were later found in a mass grave. On July 11, 1995, Mladic's ultra-nationalist forces separated men and boys from women and took them away in buses or on foot to be shot within days. It was Europe's worst single atrocity since World War Two. Wednesday's verdict, the last major case before the International Criminal Tribunal for the former Yugoslavia (ICTY) after 24 years of work, stirred tension in a region still scarred by the 1990s Balkans conflagration. Bosnian Serb leader Milorad Dodik, who frequently threatens the secession of the Serb region from Bosnia, said the tribunal's judgment of Mladic only proved its bias against the Serbs. But Bakir Izetbegovic, the Muslim Bosniak member of Bosnia's tripartite presidency, said: "No people, including Serbs, should call Mladic a hero, ..., glorify criminals and decorate war criminals." "I hope this verdict will bring about such kind of sobering in Bosnia." The opinions underscored the stillborn reconciliation process in the federal state, now divided into an autonomous Serb Republic and Muslim-Croat federation. Placards with a portrait of the once beefy and brash Mladic bearing a slogan "You Are Our Hero" plastered the sides of buildings in Srebrenica, now a largely ethnic Serb town, and nearby Bratunac on Wednesday. "The general will become a legend, and we shall continue to live as we have lived," said Milena Komlenovic, the Serb mayor of the eastern town of Kalinovik, where Mladic went to school. A woman sits by the grave of a family member near Srebrenica, Bosnia and Herzegovina, after the court ruling was handed down. She added that the international court's decisions - over 60 of 83 defendants convicted have been Serbs - had aggravated rather than healed divisions in Bosnia. Politicians in neighboring Serbia, whose 1990s nationalist president, Slobodan Milosevic, armed and funded Mladic's forces, appealed for calm and urged all to look to the future when a now democratic Belgrade hopes to join the European Union. "Our hearts are also with the victims, the victims on all sides. I do honestly feel...for all victims, but let's look towards the future," Serbian Prime Minister Ana Brnabic said. Zdravka Gvozdjar, whose nine-year-old son Eldin was killed in the Bosnian Serb bombardment of besieged Sarajevo, said the verdict was no surprise and partially satisfactory.